One of the first aircraft to be designed with a supercritical wing, designed to reduce shock waves near the speed of sound and allowing for a smoother and quieter ride, the Bombardier Challenger 600 also features a surprisingly wide cabin, with enough room to take a short walk from one side to the other or even turn a cartwheel. The Challenger 600 first started out as the Lear Star 600, a concept design penned by William P. Lear in 1974. 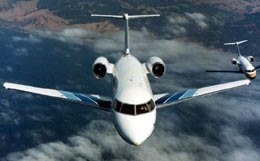 Canadair bought the rights to the jet designs from Lear in 1976 and, after major changes, developed the design into the Canadair 600, later known as the Challenger 600. The Challenger 600 is a remarkable business jet, and has been compared by many to an airliner in terms of standard of quality. This wide-body private jet provides features such as soft riding trailing-link main landing gear, a full lavatory and an impressively roomy cabin. On top of that, the Challenger 600 is one of the first business class jets to feature a supercritical wing airfoil design. This wing design not only allows for a smoother ride at near-mach speeds, but also renders the cabin quiet with low vibration. Production of the Challenger 600 started in 1980 and ended in 1983, when production of the Challenger 601 was in full swing. Production on the Challenger 600 started in 1976 and ended in 1983. This comfortable private jet offers a luxurious cabin, measuring 28.3 feet long, 8.2 feet wide, and 6.1 feet high. With such a spacious wide body cabin design, the Challenger 600 allows passengers the option to walk around the cabin for long range flights. 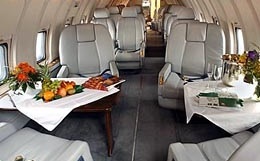 The Challenger 600 has many seating configurations, but is usually configured to seat nine to twelve passengers. However, this jet can be configured to comfortably ferry as many as nineteen. With 115 cubic feet of internal baggage capacity, there is plenty of storage room to meet passenger carry on needs. Twelve windows encompass the cabin, not only allowing for a breathtaking view, but also providing plenty of light for passenger comfort. The Challenger 600 is equipped with two Lycoming ALF 502-L-2C fanjet engines rated at 7,500 pounds of thrust per engine on takeoff. Its maximum certified service ceiling is 39,000 feet, at which the Challenger 600 can maintain its top airspeed of 458 knots. If range is more the focus of your business endeavor, the Challenger 600 can cruise at 425 knots at 43,000 feet for transcontinental distances. The Challenger 600 needs just 4,950 feet of runway to take off on a standard day and has an impressive climbing capacity of 3,400 feet per minute with both engines operative. 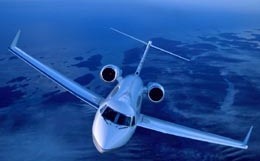 The Challenger 600 burns 262 gallons of fuel per hour on average, rendering it an economical option as well. The Challenger 600 is equipped with a Sperry SPZ-600 analog flight guidance system and dual-channel SPZ-650 autopilot, dual electromechanical ADIs and HISs, one analog air data computer, Primus 400 Weather Radar, a dual display Collins radio altimeter, and Collins Pro Line 1 Comm/Nav/Ident Radios. 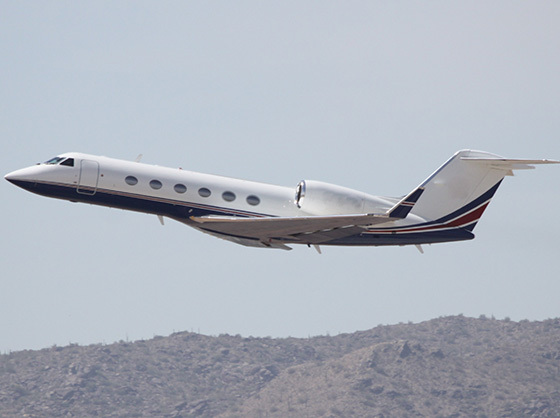 This private jet was also equipped with a Navigation GNS 500 VLF/Omega navigation system and high frequency transceivers with selective calling capability. The Challenger 600 uses a 115-VAC 400-Hz alternating current electrical system as its main source of power, backed up by three AC alternators. The Auxiliary Power Unit, certified for use up to 30,000 feet, supplies air conditioning and bleed air for engine start up. 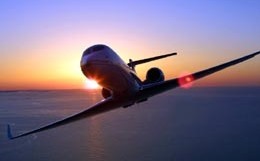 For more information about chartering, leasing or buying a Challenger 600 please contact us by calling +44-20-3874-8091 or send us an email here.